A new great uncle … and cousins! It is one of the very few of its kind in The Legal Genealogist‘s possession. One of those near-mythical objects I hear about from so many other researchers. It’s a family photograph… with names written on the back. Eleven people. Four adult males. Three adult females. Three young girls and one small child in arms who looks to be a boy. His mother’s folks — in three groups. You have Heinie, Adelheid and Henni Thoms on the left. Amko, Gretel and Erna Lauterback in the middle. And, on the right, the Nuckels. 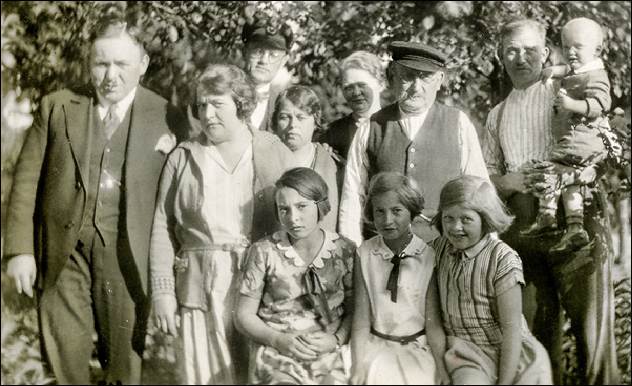 Grouped by my father as Sophie, Gerd & Friedel in back, “Grandpa,” and Wilma in front. Now this is priceless not just because it’s so rare in my family to have a photo with identifications, but even more because my German immigrant father was exceedingly closed-mouthed about his family. His parents had both died before I was born, and he rarely spoke of anyone else. It’s only because of my own research that I know that Adelheid and Gretel were the sisters of my grandmother Marie Margarethe (Nuckel) Geissler. I knew that the children of these couples — Henni Thoms and Erna Lauterback — would be a lot more challenging due to German privacy laws. I don’t know who they married, or where; I don’t have birth or death information on them. So for years I’ve concentrated on the others — an apparent family group, Gerd, his wife Sophie, and their two likely children Wilma and Friedel. And particularly on Gerd. I really really really wanted Gerd to be my great grandfather’s son, to be Marie’s brother, to pick up a great uncle and some cousins — and maybe living cousins — with the fairly-easy-to-follow Nuckel surname. Oh, I did feel like I had a good piece of evidence when I was able to put what I figured out was my Hinrich (the usual call name for my great grandfather) at the same 1932 address as a Gerhard,6 and then tracked them backwards and forwards through the city directories to show they tended to be together.7 One hitch: they weren’t always living together, and there wasn’t any pattern to when they did and when they didn’t. Sometimes one would move to a different address, but not the other. An even bigger hitch: Gerd, which can be a name by itself or short for Gerhard, is among the most common names in my Nuckel family. Generation after generation, brothers and cousins all naming sons Gerd or Gerhard, and calling them Gerd even if their legal names were Gerhard. High child mortality notwithstanding, there were always four, five or six Gerds or Gerhards to be found at any time. So putting any Gerd or any Gerhard into proximity with any other Nuckel — even under the same roof — is enough to say they were related, and closely so, but because of that common naming pattern, it’s not enough tell me for sure what their relationship was: father-son? uncle-nephew? brothers? cousins? And there was the additional fact that, though my closed-mouthed father had at least mentioned that Marie had sisters in some papers he left, I’d never heard or read a word about any brother. Now the truth is, I still thought he had to be Marie’s brother… I sure wanted him to be Marie’s brother… but had a nagging constant question: just who was this Gerd anyway? And this week, I got my answer. Ursula Krause, a German genealogist and fellow member of the Association of Professional Genealogists (APG), managed to pry a ton of records out of archives and city register offices that I just couldn’t get to (or, in some cases, didn’t get around to). My German is strictly high school — I can read it reasonably well but don’t write it well at all, and ordering records when payment is in a different currency, well, let’s just say it never got to the top of my to-do list. There’s enough in those records for a ton of Saturday blog posts but the one that blew me away was the death record of my great grandfather, the “Grandpa” of this image, Carsten Hinrich Wilhelm Nuckel. I wasn’t expecting to learn anything new except, perhaps, a place of death (it was at home at Rahdeland 1, Bremen) and a cause of death (it was reported as stomach cancer… ouch). Mostly, it confirmed what I already knew, that he died on the 15th of April 1940, his parents were Johann and Marie Margarethe (Sievers) Nuckel, and his wife — who predeceased him — was Juliane Margarethe (Smidt) Nuckel. I was right: Marie had a brother! A great uncle to add to my tree! Back to the city directories: he was alive and living at that same Rahdeland 1 address in 1941, 1942, 1950, 1951, 1952, 1954 and 195510 — the last year for which Bremen city directories are online. But was this Gerhard the Gerd of the photo? How do I know? Because, according to the Bremen burial index, a woman named Lina Sophie Henriette (Blanke) Nuckel was born on the 24th of June 1900, died on the 15th of June 1959, and was buried on the 18th of June 1959. The informant on her death certificate: her husband Gerhard Nuckel. And, the index says, she died in Bremen. The same address — Rahdeland 1 — where Carsten Hinrich Wilhelm Nuckel died in 1940. The same address where the son Gerhard Nuckel lived in 1940… and, the city directories say, until at least 1955. And remember the woman’s name written in my father’s careful hand: Sophie. How about Lina Sophie Henriette (Blanke) Nuckel? Which means Wilma and Friedel, those children in that photo, are my father’s first cousins — and my first cousins once removed. Who may, just possibly, still be alive… or who may have left me some second cousins to find. Welcome back to the family, Uncle Gerhard… and where are you, Nuckel cousins??? You may just find them! I posted on an Ancestry message board concerning one of my ex-husband’s lines in 2000. Fifteen years later, I received a response (yep, 2015!). The gentleman who responded turned out to be the third cousin of my ex. Did we have a field day sharing records and photos, or what? You bet we did! I sure have my fingers, toes and everything else crossed, Suzanne! Love those family photos! My cousin on my mother’s side of the family gave us a picture of my great-grandparents with their children. What wasn’t known at the time (myself included) that my great-great grandparents had 8 children. I have the death records for 3 of the girls and a birth record for the boy, Rolly R, but no death record. I can only presume he died as well because he doesn’t appear in the 1880 or 1900 census. The girls died from childhood diseases. When I see the picture, I think of a recently deceased president of the John Howland Society because the facial structures and features are nearly identical, if it wasn’t for the fact of a large generation gap and time. The similarity is so striking, they’d pass as brother and sister if it weren’t for the huge time difference. I have a fair number of family photos — what I typically DON’T have is any idea who’s who!! Oh, I am so happy for you. Photos that are labeled are such a treasure. You’ve done a great job of deducing, analyzing, and hoping, and it paid off. What a wonderful post. Thanks, Lisa! It’s a real joy to add this branch of the family back onto the tree! Congratulations!! I’m assuming that you have been searching for the grown-up Friedrich Nuckel and his kin all blasted day. Best of luck! I hope you find Wilma, the happy little Nuckel in the front! What a moving post, Judy! I hope you find Wilma’s children, or even Friedel, who, being male, might be easier. And bless your father for labeling at least this picture. And your “helper” in Germany! Thanks, Doris! It really is a great move forward. My father’s umlaut over the u notwithstanding in his caption to the photo, they were Nuckels without the umlaut — all of the records in Bremen are just plain Nuckel, not Nückel or Nueckel.